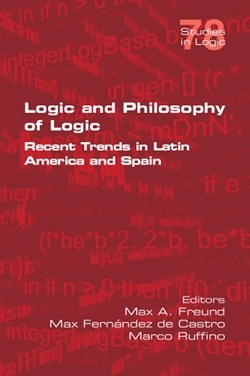 Logic and philosophy of logic have increasingly become areas of research and great interest in Latin America and Spain, where significant work has been done and continues to be done in both of these fields. The goal of this volume is to draw attention to this work through a collection of original and unpublished papers by specialists from Latin America and Spain. Some of the papers are of importance for set-theory and model theory. They cover topics such as the foundations of paraconsistency, the use of paraconsistent logic as a basis for set-theory, and the methodological aspects in both the justiﬁcation of new axioms in set theory and the formalization of pre-theoretic notions. Other papers are related to epistemic logic. They deal with the issues of abduction and the choice of the simplest hypothesis, the definition of group probability, and the nature of explanation and understanding in such logic. There are also papers on logical paradoxes, the semantics of names (including fictional names), and the nature of relations. Max A. Freund is Professor of Logic and Philosophy at the University of Costa Rica and the National University of Costa Rica. He is co-author of the book Modal Logic: its syntax and semantics (Oxford University Press, 2008), as well as the author of Judicial Logic (Costa Rica Institute of Technology Press, 2007), and of a forthcoming book The Logic of Sortals (Springer, 2019). Max Fernandez de Castro is Professor of Logic and Philosophy at the Autonomous Metropolitan University of Mexico (at Iztapalapa). He is the author of the book Quine y la Ontología Abstracta (Porrúa, 2003) and co-author of the books Lógica Matemática I: lógica proposicional, intuicionista y modal (País, 2011), Lógica Matemática II: clásica, intuicionista y modal (País, 2011), Teoría de Conjuntos, Lógica y Temas Afines I (UAM Press, 2013). Marco Ruffino is Professor of Philosophy at the University of Campinas (UNICAMP, Brazil) and the editor of Manuscrito, the Brazilian international journal for Analytic Philosophy. He has many publications, in important philosophical journals, in the philosophy of language, of logic, and of mathematics; in the history of analytic philosophy, and on Frege and Wittgenstein.